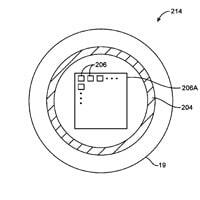 A newly published patent application shows that Apple has been working on ways to combine the fingerprint verification technology it acquired in July 2012 with NFC — and may also be eyeing a variation of NFC that uses “body coupled communications”. The “Electronic device with shared near field communications and sensor structures” patent application, filed in February 2013, describes a sensor built into the home button of a mobile phone that combines both fingerprint biometrics and NFC functionality. It also suggests alternative locations for the sensor and ways in which NFC could be used to provide wireless docking and short range communications capabilities for a range of application scenarios as well as what seems like a form of NFC using the human body as a transmission medium. The sensor may be a touch sensor that uses the conductive structure to form a capacitive touch sensor electrode or may be a fingerprint sensor that uses the conductive structure with a fingerprint electrode array to handle fingerprint sensor signals. Near field communications circuitry may be included in an electronic device. When operated in a sensor mode, the sensor circuitry may use the conductive structure to gather a fingerprint or other sensor data. When operated in near field communications mode, the near field communications circuitry can use the conductive structure to transmit and receive capacitively coupled or inductively coupled near field communications signals. “When it is desired to use transceiver circuitry 24 for near field communications, structures 22 in button 19 may be used in transmitting and/or receiving near field communications,” the patent application adds — suggesting that NFC could be enabled and disabled via the home button, to maximise battery life and require explicit authorisation by the user for any NFC interaction. This opens up a scenario where an iPhone user might push the home button on her device and then simply touch another device to complete a circuit and allow data to pass between the two machines, using her body as the conduit. Most recently, this concept has been developed by US firm Microchip Technology. The company’s BodyCom technology is activated by capacitively coupling to the human body and enables bidirectional communications between a centralized controller and one or more wireless units. Exactly what new technologies the next iPhone will include won’t be known until Apple reveals the widely expected iPhone 5S on 10 September. That said, a key advantage of Authentec’s fingerprint sensor technology is its deep integration with NFC. The latest leaked images, meanwhile, suggest that a new home button construction, compatible with the concepts outlined in the patent application, will be included in the next edition of the iPhone. Detailed images of the components of the home button have also been published by Australian site SonnyDickson.com.